I've started on another dress - I know, I know, my mom used to tell me aaall the time "finish what you're doing before you start something new! ", you tried mom but I guess my brain doesn't want to work that way! (but I did make a first, simple harness! that's a different post though) - and I'm not alone with this one! A quick google search will show you, that many sewing bloggers have taken inspiration from the first Hunger Games Movie, or to be more precise: the "Reaping" scene. I first saw this dress on Gertie's Blog, before I even saw the movie. That's actually what made me want to see it. The appeal of the dress, I think, is how simple yet elegant it is. It looks like an old dress, just the way the fabric looks (so soft! ), but the almost perfect fit makes it beautiful. Because I'm newly enthusiastic about shirring, I've decided to shir the waist at the back. And even though the original is probably just gathered at the neckline, I want to shirr that part too. 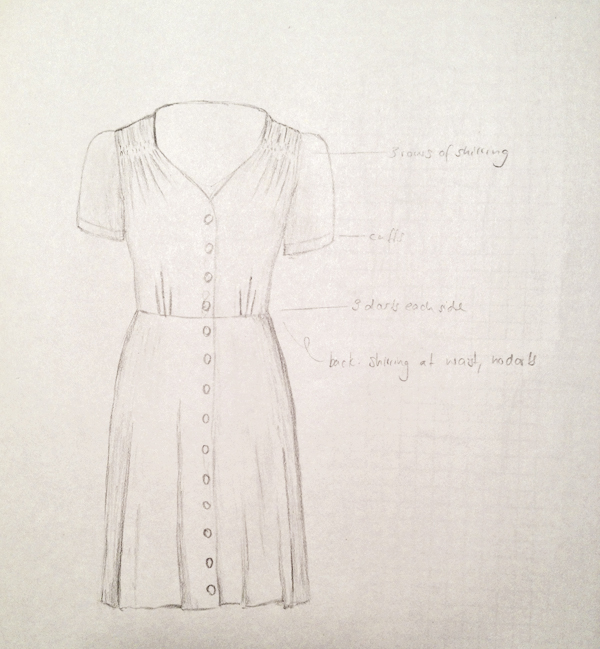 Also, to make it easy to get into and out of, I want the button placket to extend all the way down the dress. Before I started manipulating my bodice block, I sketched out the different steps I'd have to take. I find this really helps! I don't really reference it afterwards, but it just helps the thought process. I spent about 3 hours total drafting the pattern (I always wonder why it takes so long? maybe listening to Harry Potter audiobooks slows me down...) today and started a wearable muslin. I plan to make it a peplum blouse. I'm really happy with how it's turning out! I can already tell that I'm going to have to add a little more ease, especially to the back bodice and sleeves to make it more comfortable, but I even like the blouse without the neckline shirring detail. Would you be interested in seeing the drafting process? I used a mixture of dart-splitting (front and back bodice) and changing a dart to gathers (front bodice). I'm curious how the back bodice manipulation will turn out, I split the back bodice dart into about 5 darts, spread evenly across the waistline seam to accomodate the shirring, to make sure the volume will be correctly distributed. I didn't find anything on this on the internet, so if it turns out well I might make a little "tutorial", what do you think? Isn't it gorgeous? Am I mad for wanting to sew something that's going to be a pain to match up at the seams? Maybe it's the kind of challenge I need right now, I've never worked with hard-to-match-at-the-seams fabric.